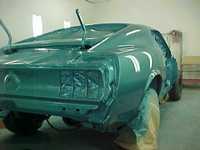 Restoring a 69 Cobra Jet 428 Mustang Mach 1! Updated! In 1970, Fred Nolan was in Sydney Australia when he noticed the Mach 1 Mustang parked in William Street, Kings Cross. That image has never left his mind for the past 40 years. Mean while In the USA on the other side of the Pacific, a Gulfstream Aqua painted Ford Mustang was some 12 months old. 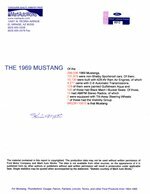 Courtesy Ford in Nappa CA sold the Mustang on 27 November 1968. It was the new 428 cu in CJ-R powered Cobra Jet model that was ordered on 7 August and built on 14 November 1968. A Mach 1Sports Roof fast back, it featured Black Clarion Knit/Vinyl Mach 1 High Back Bucket seats, 3.50 Traction-Lok Axle Ration, C-6 Cruise-O-Matic Transmission, Visibility Group, F70x14 Wide Oval Belted White Side-Walled Tyres, Sport Deck Rear Seat, Power Front Disc Brakes, Power Steering, Tilt-Away Steering Wheel, AM/FM Radio and Tinted Glass. Only 129 of the 13,261 CJ and SCJ 428 model car’s were painted Gulfstream Aqua in 1969 and this car is actually a one of one with it’s particular options. This particular CJ-R is a very rare Mustang with super hot performance. When purchased by Fred, the powerful Mustang was located at Fontana CA (near Disney Land) and had several owners over its life. The car had been dormant for many years as evident by its condition on arrival in Australia. 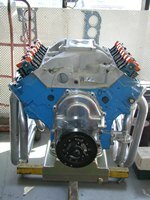 The cars 428 engine was cast 9 July 1968, which matches the vehicle production date and was in overhauled condition. 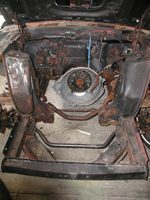 The car also came with a spare 428 CJ engine as well as C6 Transmission. 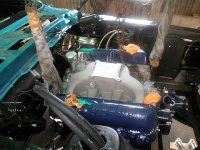 The engine has been slightly modified featuring Harland Sharp Roller Rockers and Blue Thunder Aluminium Intake Manifold with Hedman stainless steel Headers (Extractors). 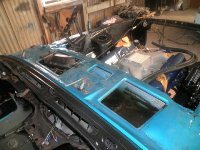 On June 26, 2010, the car arrived at Ron Woods (RJ Motor and Body Repair) facility at Port Macquarie and restoration started that same day. With a Commercial Aviation background, Fred has collected and restored several single and twin engined aircraft and together with wife Kath, own and drive a second Mustang, a 1968 GT390 Fastback. Always big on horse power, he flew 1,230 hp turbine powered Ayres Turbo Thrush airplanes. His motto has always been that “If it hasn’t got 300hp, don’t fly it !”. 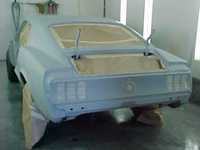 The 68 “Stang was acquired in 2009 and the full zero time restoration was also completed by Ron Woods in March 2010. The search for a second car was conducted by Pete Tate of Foytt Shipping and Auto, a vehicle Import/Export specialist based out of Carson, California. 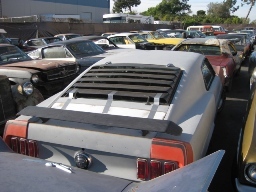 On 20 February 2010 the Big Block CJ Mustang was found and collected and was delivered Pete’s Los Angles warehouse. The 40ft high cube container with its precious cargo departed Long Beach California arriving in Sydney 16 June 2010. The car will be kept Left Hand Drive. 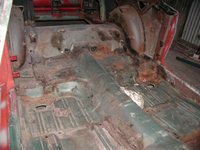 Detailed inspection revealed that the car was largely rust free,in good order but missing many parts. It had obviously had a hard life and many owners. The metal cut out’s in the firewall appear to suggest a heavy drag/race history, an occupation that many of these vehicles were destined for. The body undamaged but the front chassis rails were slightly bent and required straightening. 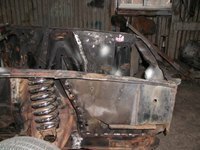 The door, hood & trunk gaps fit well, and the under body showed no signs of deterioration or damage. In fact after cleaning, the under belly was in excellent condition and very original. The glass is all reusable as is the dash board, front door trim and front seat upholstery. The centre console is reusable. 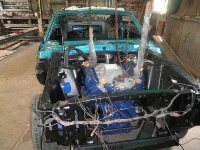 A Rack and Pinion & Power Steering kit from AOI will be installed. 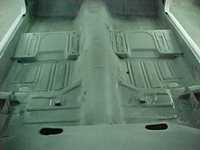 The front/rear floor pans were replaced together with some minor repairs to the sub-frame separating the cabin/trunk area. 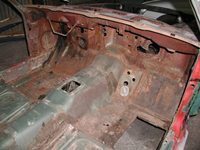 Rust was removed from the lower RHS rear guard. The 28 Spline 9” Differential supplied with the car was not the correct unit and a correct CJ 31 Spline assembly with the original 3.50:1 Traction-Lok Differential was sourced from Victoria with a 3/69 cast date. The engine was zero time overhauled in the USA and upgraded with Harland Sharp Roller Rockers and Blue Thunder Aluminium Intake Manifold together with Hedman stainless steel Headers (Extractors). The big 428 CJ was delivered to John Black of Engine World Port Macquarie for disassembly and inspection. 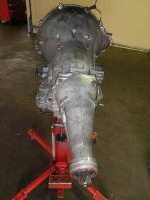 John verified its condition and detailed what additional parts were required to complete the engine installation. The Cam Shaft was ground back to a milder status to run unleaded fuel and to make it an every day driver. Hydraulic lifters were also installed. Also missing from the car was the radiator assembly. 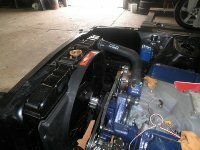 The engine bay will be painted Ford Satin Black and the engine block correct Ford Corporate Blue. The factory 12 Slot Steel wheel rims will be stored and 17” x 8” (front) and 17” x 9” (rear) Coy C67 with polished alloy centres installed. 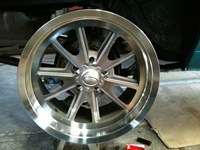 255/40ZR17 98W Low Profile Toyo Proxe 4’s will be fitted to the rear whilst the front will receive 245/40ZR17 95W tyres. Fred is a member of the Moree Motor Enthusiasts Club ( www.mmec.org.au ) and on completion of its restoration, the Mach 1 CJ-R will keep company with 68 GT390 Highland Green Fastback Mustang, one of a small batch of 316 cars produced of which 2 were used in the Warner Bro’s Movie “Bullitt”, starring Steve McQueen. 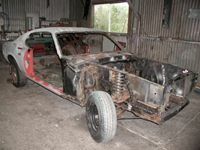 The 428 Mach 1 project is planned for completion by mid-2011.